Prominent & Leading Manufacturer from Jaipur, we offer tribal banjara patches. 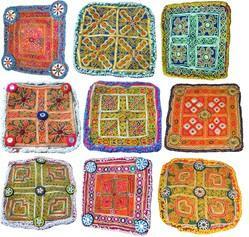 Vishal handicrafts presents authentic antique banjara patches More then 100 pieces in stock. These great patches made from athentic antique fabric from the banjara tribeof the Rajasthan desert in central India is great for belly dance costumes as a neck yoke stitched or can be used as a table mat or a sofa decorative. Anything you want it to be. Handmade in India, there is intriguing needlepoint and embroidery work throughout, and the patches have some weight to it.